You have chosen a room not compatible with a room . Please choose another room with the same type of payment or delete the one you have selected. 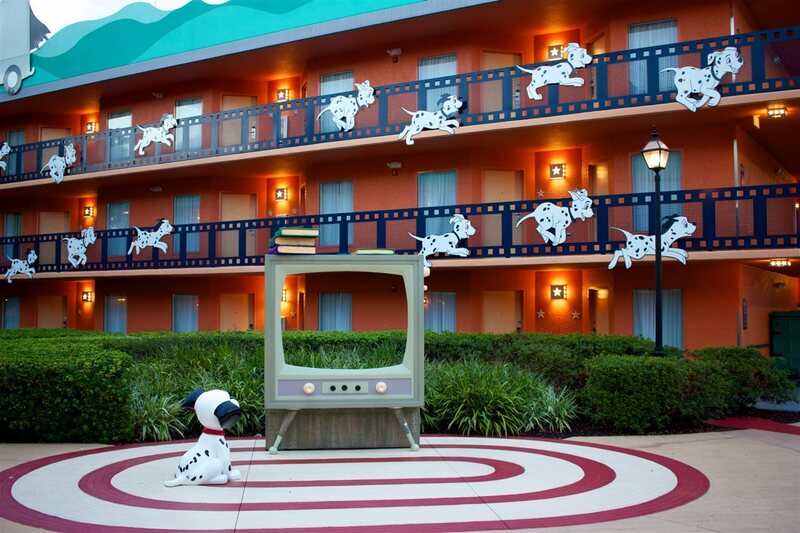 With a stay at Disney's All-Star Movies Resort in Lake Buena Vista (Bay Lake), you'll be within a 5-minute drive of Disney's Winter Summerland Miniature Golf Course and Disney's Blizzard Beach Water Park. This family-friendly resort is 3.1 mi (5 km) from Disney's Animal Kingdom® Theme Park and 3.4 mi (5.4 km) from Disney's Boardwalk. Make yourself at home in one of the air-conditioned rooms featuring refrigerators. Complimentary wireless Internet access keeps you connected, and satellite programming is available for your entertainment. Bathrooms have shower/tub combinations and hair dryers. Conveniences include safes and irons/ironing boards, as well as phones with free local calls. Make use of convenient amenities such as babysitting/childcare (surcharge), an arcade/game room, and gift shops/newsstands. If you're planning a day at a nearby theme park, you can hop on the complimentary shuttle. Enjoy a satisfying meal at World Premiere Food Court serving guests of Disney's All-Star Movies Resort. Wrap up your day with a drink at the poolside bar. Cooked-to-order breakfasts are available daily from 6 AM to 11:30 AM for a fee. Featured amenities include express check-in, express check-out, and dry cleaning/laundry services. A roundtrip airport shuttle is complimentary (available 24 hours). Discover all I Lake Buena Vista can offer you!